Observation - Hazel plus > - UK and Ireland. 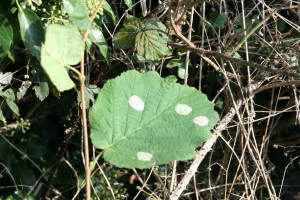 Description: Circular silvery marks on hazel leaf, with an orange centre. the patches are about 2cm. in diameter. Circular silvery marks on hazel leaf, with an orange centre. the patches are about 2cm. in diameter.